"Livid" Alan Pardew has told his players they have "no excuse" not to progress in the Capital One Cup tonight. The Newcastle United boss has barely let his frustration simmer after the Magpies' careless defeat against Hull City, which resulted in some home truths being delivered to his squad in the wake of the 3-2 reverse. He feels the team squandered a golden chance and will tell his senior men – many of whom will be included to face Leeds – to make up for the disappointment in what promises to be a fierce clash with Brian McDermott’s Whites. Yohan Cabaye, Shola Ameobi and Jonas Gutierrez will all miss out, but Pardew has confirmed Cheick Tiote will return and that the team will no carry as many “risks” as the side that he played against Morecambe. Their work has been cut out for them by their manager. “I’m so disappointed about Saturday, I can’t begin to tell you. It hurts me to tell you now, two days later. We had a great opportunity to get into top four which might not come around again. We need to put that right,” he said. The Capital One Cup has rocketed up United’s list of priorities this season after they failed to qualify for the Europa League, and Pardew wants to see his team in the draw for the fourth round. That would go some way to repairing a domestic cup record that Pardew admits is not good enough. Responding to a poll by our sister title the Chronicle which suggested Newcastle fans would prefer to see the team win silverware than finish in the top six, Pardew agreed that making an impact on the League Cup was a priority. “That doesn’t tell a lie,” he said. “Those polls are pretty accurate, I’d suggest that’s where our fans are, they want to win a trophy, they want to go to Wembley and see some silverware. So do I, trust me. I’ve come close before. I want to win something. “This competition is one that over the last few years has been contested by squads to a degree by clubs in the Premier League. That is because we want to see what options we have for the league, and maybe that’s a little bit demeaning. We’ll have a strong squad, but there are one or two I want to look at, to see if they can push to be starters, the likes of Paul Dummett and Sammy Ameobi, who are knocking on the door. One player unlikely to figure tonight is Haris Vuckic, who was targeted by League One Bradford City last month. Pardew fielded him against Morecambe but withdrew the Slovenian at half-time and feels that he needs more games to get back into first-team contention. 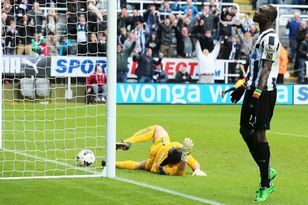 However, the Newcastle manager admitted that he had yet to field a loan enquiry about the striker. “Haris is fighting with a number of players to get in or around the team. I am not going to give too much away about tomorrow’s team,” he said.